The R&N ladies were at Droitwich in the third round of the Midland Womens XC League Division Two and Bethan Goddard was the leading runner once again as she finished in 10th place over 6k. The club champion recorded 27:19, which helped the team to 7th on the day. Tilly Lea was the next athlete over the line in 44th spot (29:36) and 12 seconds behind was veteran Sophie Wilkinson-Hargate in 47th position. Completing the quartet was U20 runner Olivia Sheehan in 68th on exactly 31 mins, which placed her as the 8thJunior. 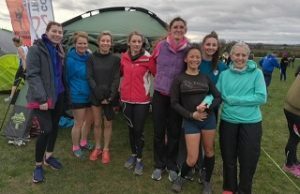 R&N had four other Masters athletes taking part with Kate Williams ( 98th in 32:57), Zoe Shepherd ( 110th in 33:21), Helen Jones ( 117th in 33:44) and Minerva Chesser ( 121st in 34:06).